No one told me in high school how much free time I really had and then when I got to college I was quite shocked at the increased workload. Fast forward 3.5 years later, I’m working at least 50-55 hours every week, plus trying to maintain the household, coupon, garden, raise chickens, thrift shop, and attempt to get back into some of my favorite hobbies. It’s exhausting! Couponing is still a priority of mine so I still try to grab deals weekly! I seriously do not know how people afford not to coupon nowadays. My shopping list is dictated by deals! How do other people do it?! As long as I have a shopping schedule, I’m much more likely to stick to it. By going to Safeway every Sunday morning, for example, I set up a nice little routine. Pictured above was last Sunday’s Safeway trip. 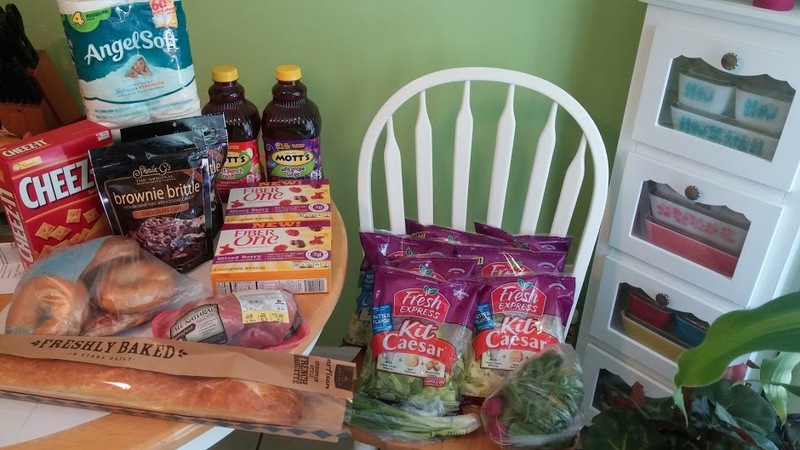 Some highlights were the $0.49 Fresh Express kits, FREE Fiber One fruit snacks, $0.49 Mott’s, and $0.09 Angel Soft. I think my total was around $19 (thanks to meat, bread, Cheezits and Brownie Brittle). 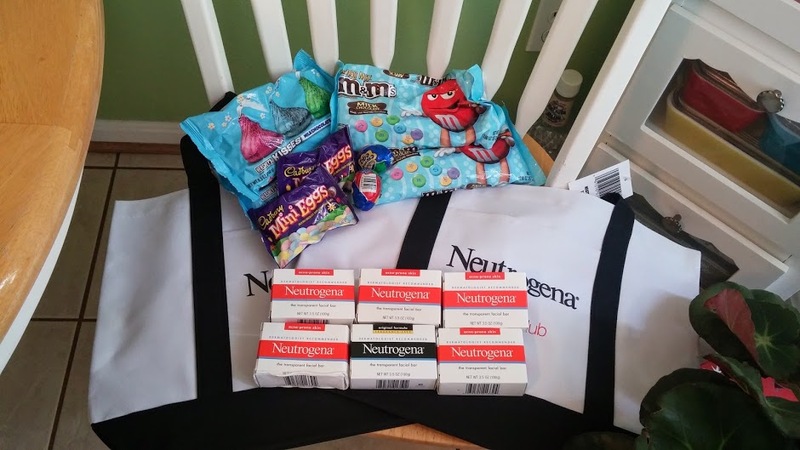 I went to CVS twice already this week to finish out that great Neutrogena deal! I was fortunate enough to get 6 soaps (without evening clearing the shelf) but when I went to finish the deal (I didn’t realize I only needed to buy one more product to get $10 back until I got home), two stores were sold out of them. 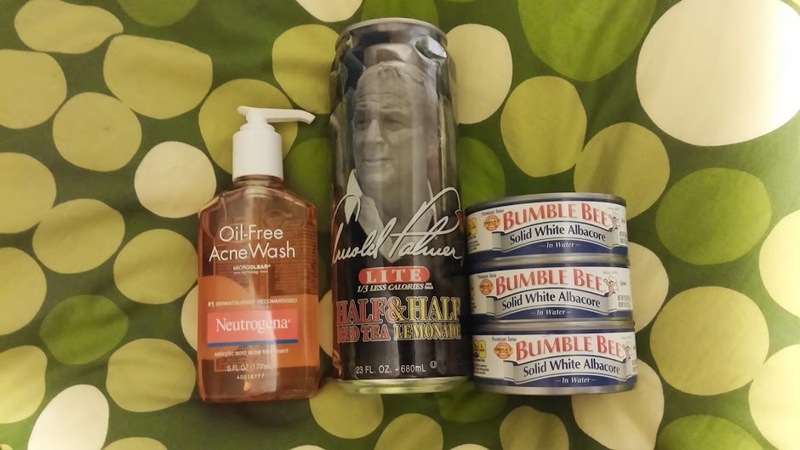 I grabbed the face wash instead and still ended up with a money maker and 2 free tote bags. The first picture shows my first trip where I paid about $2. I used up MQs and CVSQs on clearance Easter candy! I went the following day (picture #2) and paid just $0.20 and got a $10 ECB back. Not bad! Great Coupon for $0.75 off 1 Package of Ritz Crackers! Great for Doubles! Here’s a fantastic coupon to print for $0.75 off any ONE package of RITZ Crackers! I love Ritz crackers! I can eat an entire roll in one sitting. That’s probably why we don’t buy them very often! Hopefully we can pick some up for cheap with this coupon. If your grocery store doubles, that’s $1.50 off a package which is awesome! It doesn’t expire until after Christmas, so keep your eye out for the winter boxes on clearance. https://savvywifehappylife.com/wp-content/uploads/2016/09/SavvyWifeHappyLife-logo-2.png 0 0 Brandi https://savvywifehappylife.com/wp-content/uploads/2016/09/SavvyWifeHappyLife-logo-2.png Brandi2013-12-12 12:15:142013-12-12 12:15:14Great Coupon for $0.75 off 1 Package of Ritz Crackers! Great for Doubles! Safeway has Luvs Jumbo packs for just $5 – TODAY only! 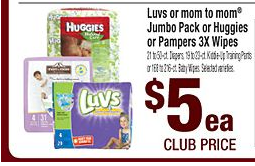 Print the $1.00 off ONE Luvs Diapers and pay just $4 each. There is no limit! This is a great and easy way to stock up on diapers. New Softsoap Coupons to Print! (Great for Doubles) – $0.49 at Safeway! We just got a bunch of new coupons over the weekend, so stay tuned for some updates! I’m loving these new Soft Soap coupons! I see cheap soap in our future. Final cost = $0.49 each! https://savvywifehappylife.com/wp-content/uploads/2016/09/SavvyWifeHappyLife-logo-2.png 0 0 Brandi https://savvywifehappylife.com/wp-content/uploads/2016/09/SavvyWifeHappyLife-logo-2.png Brandi2013-10-27 16:43:322013-10-27 16:43:32New Softsoap Coupons to Print! (Great for Doubles) - $0.49 at Safeway! Safeway Shoppers! 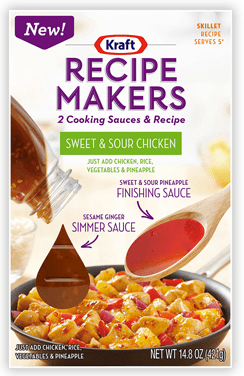 Grab a coupon for a free package of Kraft Recipe Makers. First 30,000 people, so hurry! You’ll certainly want to print this new coupon for $0.55 off any one (1) SKIPPY peanut butter product! If your grocery store doubles coupons, you’ll score $1.10 off a jar of peanut butter… that’s HOT! Print this coupon ASAP because it won’t stick around long and you don’t want to miss it. New $1/2 Barilla Coupon = Print for FREE Pasta! Here’s a new coupon for Save $1.00 when you buy any TWO (2) boxes of BARILLA Pasta! I’d print this coupon now because Barilla is almost always on sale for $0.88-$1 somewhere around down. Also, if you’re local, Glen Burnie ShopRite will double this $1 coupon, giving you $1 off a box a pasta = FREE pasta (just check for sales!). Print asap because it’s a Smartsource coupon and won’t stick around long! https://i0.wp.com/savvywifehappylife.com/wp-content/uploads/2013/09/Screenshot-2013-09-10-at-11.05.50-AM.png?fit=376%2C125&ssl=1 125 376 Brandi https://savvywifehappylife.com/wp-content/uploads/2016/09/SavvyWifeHappyLife-logo-2.png Brandi2013-09-10 11:07:262013-09-10 11:07:26New $1/2 Barilla Coupon = Print for FREE Pasta! If you have a kitty or like to donate to the animal shelters, I would totally print this coupon for $0.50 off TEMPTATIONS Cat Treats & Cheezy Middles! Usually we’ll see Temptations on sale for around $1. If you grocery store doubles, you’ll score $1 off 1 pack of cat treats. That’s a great deal! Expiration date isn’t until January 31, 2014! New Jennie-O Turkey Bacon and Sausage Coupons! Coupons.com released two new Jennie-O Turkey coupons! These never last long, so don’t delay in printing! If your grocery store doubles coupons, I bet you’ll score some cheap bacon after it goes on sale! https://savvywifehappylife.com/wp-content/uploads/2016/09/SavvyWifeHappyLife-logo-2.png 0 0 Brandi https://savvywifehappylife.com/wp-content/uploads/2016/09/SavvyWifeHappyLife-logo-2.png Brandi2013-08-16 22:05:202013-08-16 22:05:20New Jennie-O Turkey Bacon and Sausage Coupons!